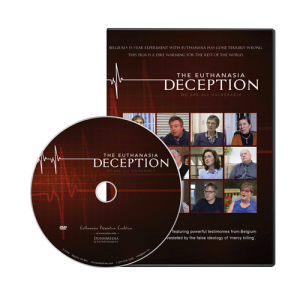 The Euthanasia Deception is a 52-minute documentary featuring powerful testimonies from Belgium, Canada and beyond of lives devastated by the false ideology of “mercy killing”. One DVD is $30.00. Bulk pricing is also available in the drop-down below: 4 DVDs for $100 (savings=$20) or 10 for $200 (savings=$100). A version with French subtitles (avec sous-titres en français) is also available. Please be sure to specify in the comments section that you would like this version. If you prefer, orders can also be made by calling us at 519-439-3348 or 1-877-439-3348 or by e-mailing info@epcc.ca. Posters can be filled out in Adobe Acrobat Reader, which is free to download.